LONDON – Jeremy Corbyn wants Google and other online giants to pay for a better BBC. In a speech made at the Edinburgh TV Festival this week, the leader of the UK opposition, Jeremy Corby called for a new tax to be paid by internet giants in order to fund media in the UK. 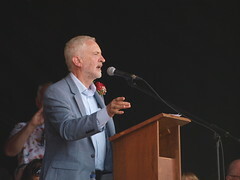 Jeremy Corbyn referred to the internet giants such as Google and Facebook as digital monopolies which “profit from every search, share and like we make”. He claimed that a windfall tax would be an adequate way to raise funds which could be used to pay for an improvement and expansion of “public interest media” such as the BBC. He even indicated that the funds could be administered by an independent body, which would be charged with the betterment of media in the UK. Alternatively, he said that the funds could come from a digital license fee which would replace the traditional license fees. The TV license fee is paid by all households in the UK with a TV. Jeremy Corbin has suggested that a digital license fee would reduce the financial burden faced by poorer families in the UK.